Heads up! 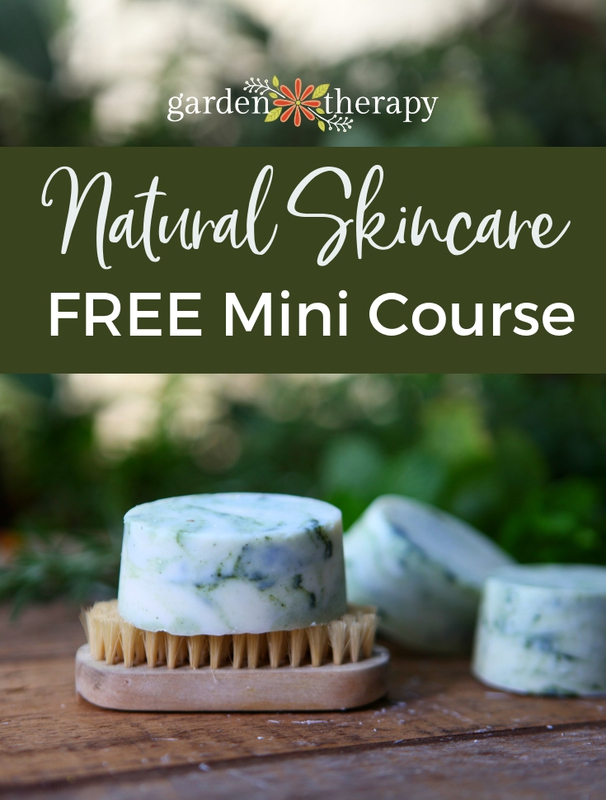 These rose skincare recipes are sponsored by iHerb who has a special offer for Garden Therapy readers at the end of this post. 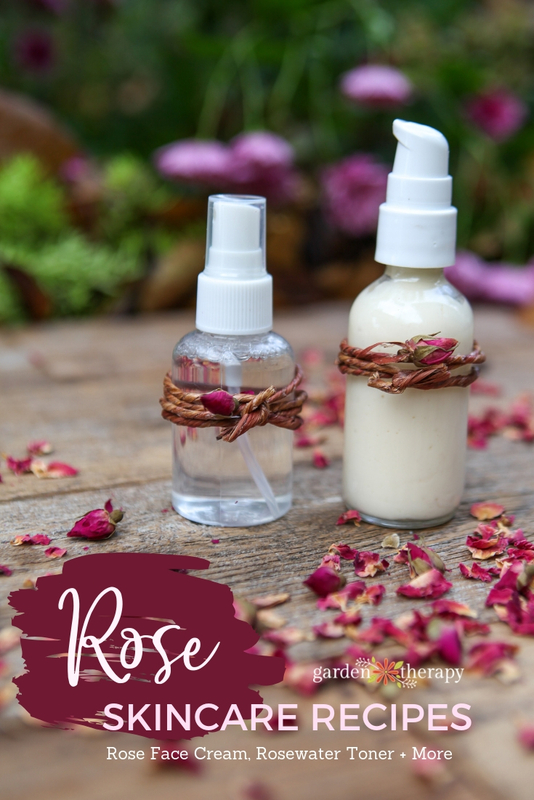 People have been taking advantage of rose skincare recipes for thousands of years—ancient Mayans, Romans, and Egyptians all used rose to make their skin more beautiful. 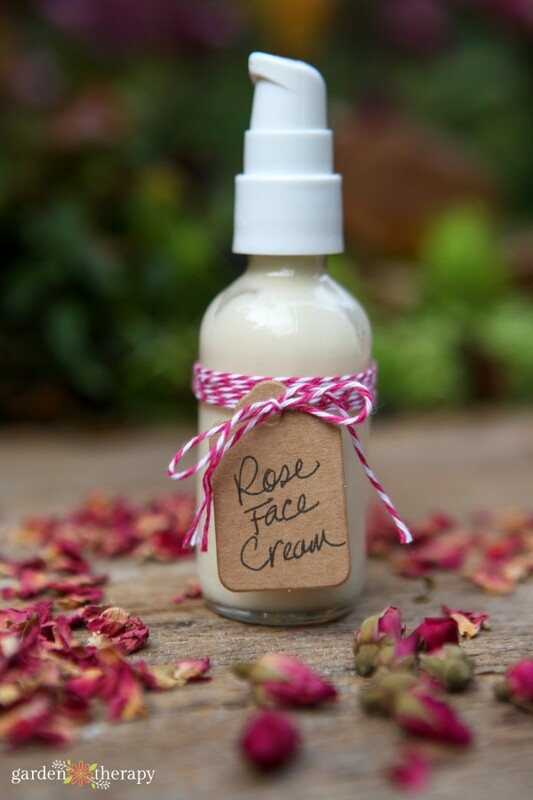 Rose tightens skin, evens tone, reduces discoloration, and can help heal scars and reduce wrinkles. Not only that, it increases the skin’s permeability, which means that it makes whatever ingredients you combine with it even more effective than they would be on their own. Oh, and it smells heavenly. 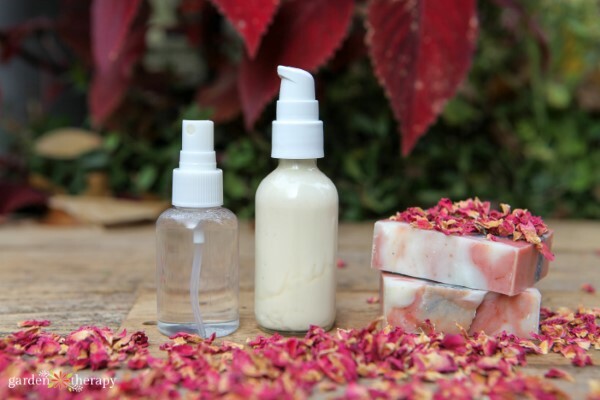 All of this makes rose a wonderful ingredient for facial skincare products. 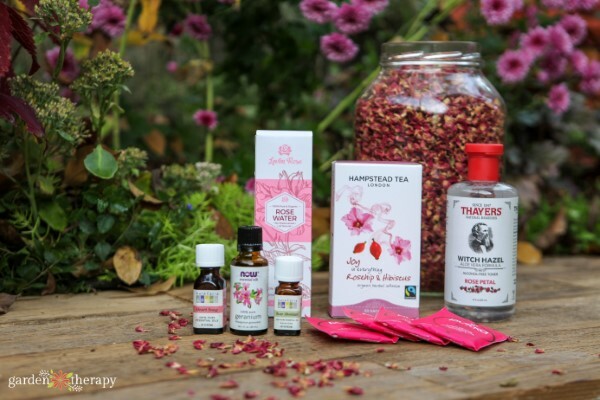 There are lots of different ways you can incorporate rose into your daily beauty regime, so I’ve put together a few simple rose skincare recipes for the face that you can try. You’ll be feeling rosy in no time. This post has been sponsored by iHerb who also provided me with ingredients to make the recipes. iHerb carries over 7,000 bath and beauty products that can be shipped to over 150 countries. When I searched for “rose”, I was thrilled to see over 900 results from dried rose petals to crafted skincare products, many of which are organic and hard to find ingredients. It’s the easiest herb supply out there! 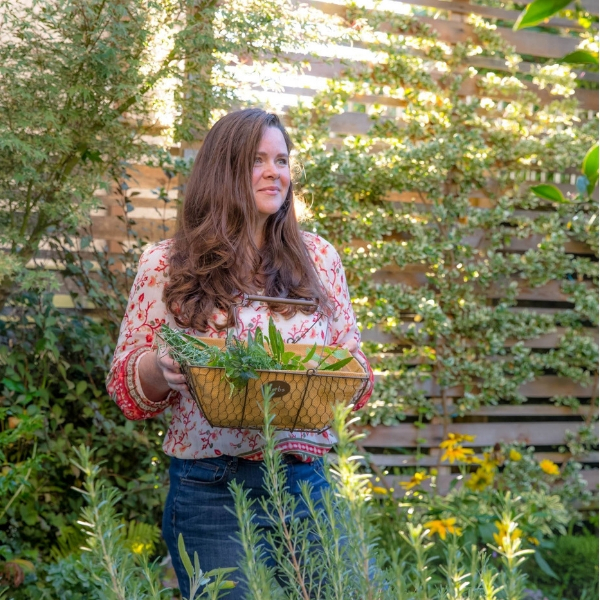 Don’t miss the special offer for Garden Therapy readers at the end of this post. 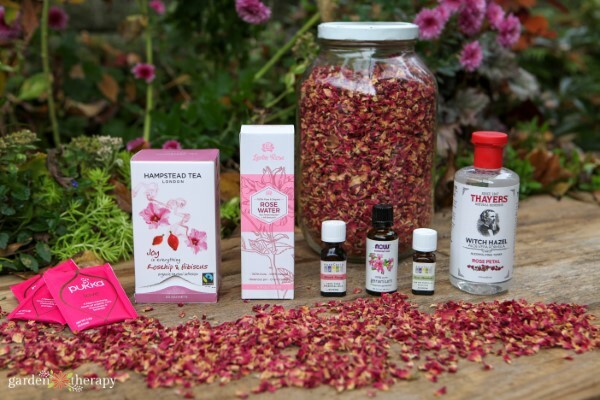 Here are a few rose products that I regularly add to my natural beauty recipes in order to give it the healing properties of rose. Rose is one of the most precious, and therefore expensive, essential oils. It requires hundreds of thousands of rose petals to get an ounce of oil, so it makes sense that an ounce would sell for a thousand dollars or more. When you see rose essential oil, it may be pure but in a very low quantity (like 2ml or 0.067 oz), it could be diluted in a carrier oil, or it could be added to a blend. There are three products at iHerb that I tried out to get the benefits of rose for my rose skincare recipes. This pure rose essential oil only contains 0.125 fl oz (3.7 ml) but at under $350.00/fl oz it’s an absolute steal! And a few drops will go a long way. The scent of this oil is rich and floral, and it should be enjoyed like an incredibly expensive wine. If the price of rose absolute is too dear, then let the essential oil experts do the blending for you. Heart Song is a blend of rosewood, lavender, coriander, geranium, and rose absolute. It has a strong floral scent to create the feeling of romance. This essential oil is not rose but it has a sweet floral aroma that blends well in rose skincare recipes. Pelargonium graveolens, or geranium, is purifying, soothing, and normalizing for skin. 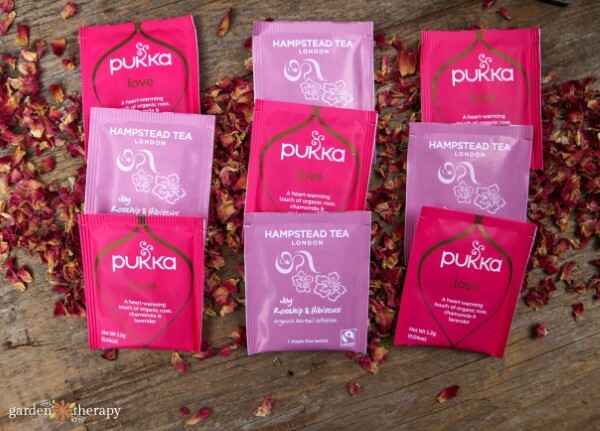 You can create lovely floral infusions steeping rose petals and rose blend tea in water. Floral water can be spritzed on your skin after washing or it can be used to replace distilled water in skincare recipes and soap. Rose petals are easily accessible and inexpensive (or free if you grow them in your garden!). You can use them to infuse oils with their scent or make a rose hydrosol which can be added to recipes or used as a toner on its own. Rose petals have anti-inflammatory properties that help to tighten skin and reduce redness and other discoloration. Add this infusion to beauty recipes to add a pleasant fruity, slightly tart fragrance. Hibiscus is full of antioxidants and Vitamin C which nourish the skin and prevent the look of aging. Rosehips are also a source of Vitamin C and antioxidants, so these two ingredients together are wonderful to tighten and repair skin. Brew this tea and add it to facial skincare recipes for a light floral scent. Lavender, chamomile, and rose all have soothing properties that can help calm both your skin and your mind. Chamomile also has antimicrobial and anti-inflammatory properties which can help speed up the healing process of minor cuts, scrapes, and scars. 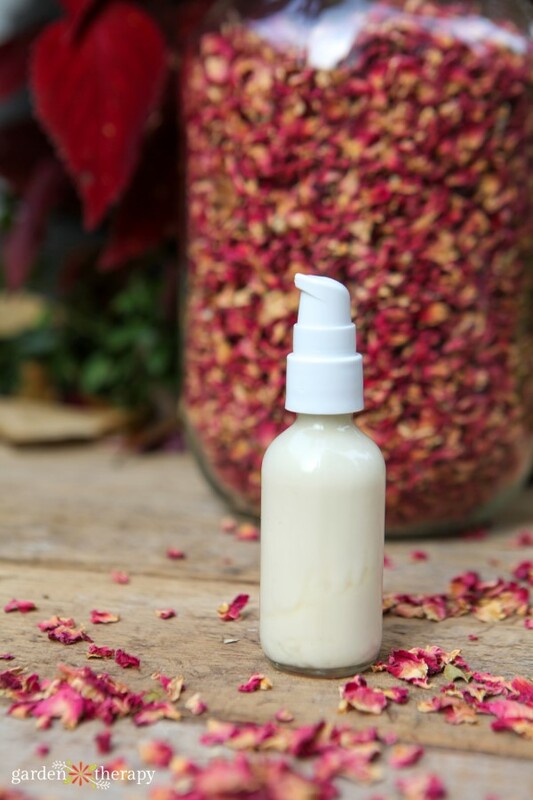 Rosehip seed oil contains essential fatty acids which help to regenerate skin, reducing scars and wrinkles. It also has Vitamin A, which helps even out skin tone and makes skin look brighter. 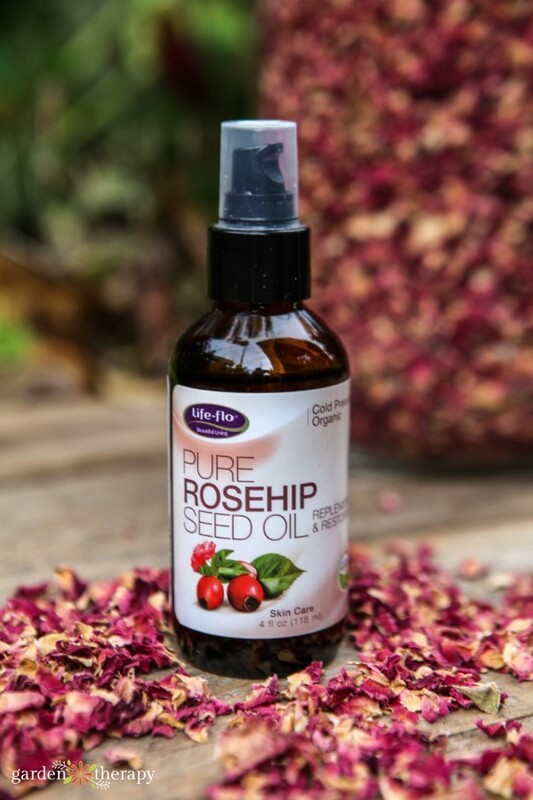 You can use rosehip seed oil directly on the skin or as an ingredient in skincare recipes. It absorbs quickly and is great as a massage oil to gently rub into wrinkles, dry hands, and cracked heels. 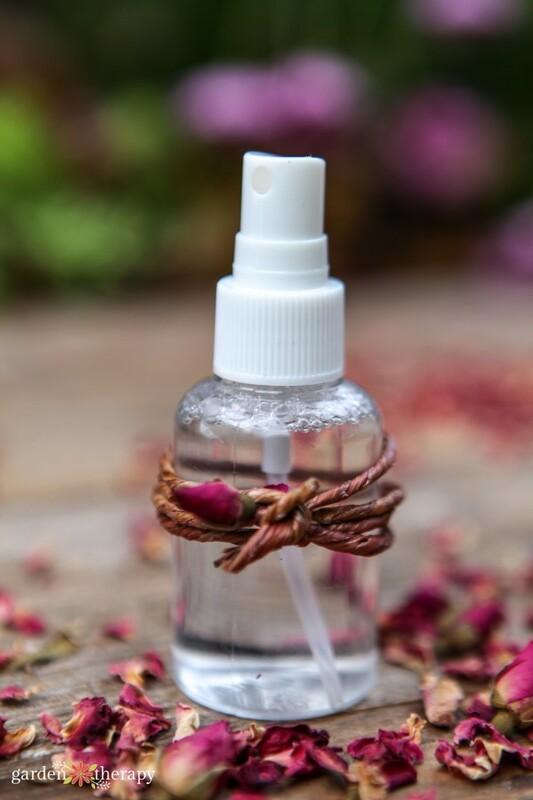 Spritz or dab rosewater directly on your face to refresh and brighten skin, or add it to recipes like lotion that call for aqueous ingredients. 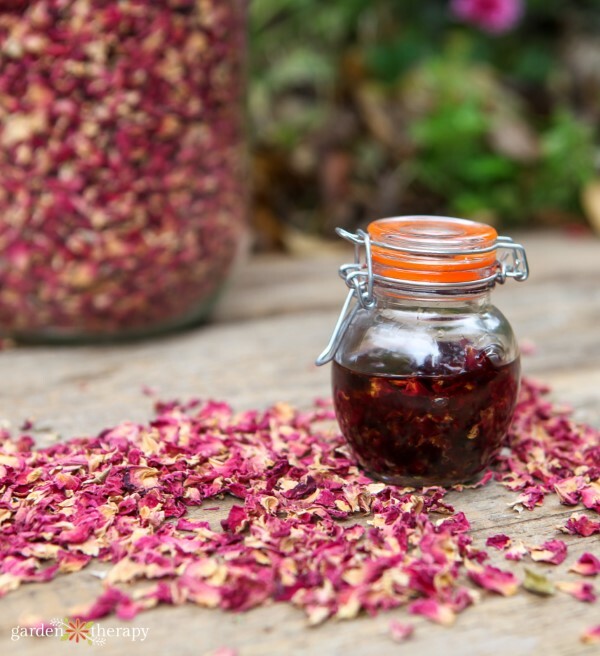 Rosewater has a wonderful, delicate scent and helps to tighten skin and even tone. Witch hazel is a natural toner that evens skin tone and soothes. The addition of rose petal helps to brighten skin and gives this product a beautiful scent. Witch hazel can make inflamed, irritated skin feel better, so this product works well as an after shave as well as a regular toner. Since attending an herbalism class on the skin benefits of rose, I have been using rose as my face care routine and I just love how it makes my skin feel. I always wash with cold-process soap first, then spray with rose face toner, and finish off with my favorite rose face cream. I do this routine both morning and night to clean, nourish, and repair my skin. 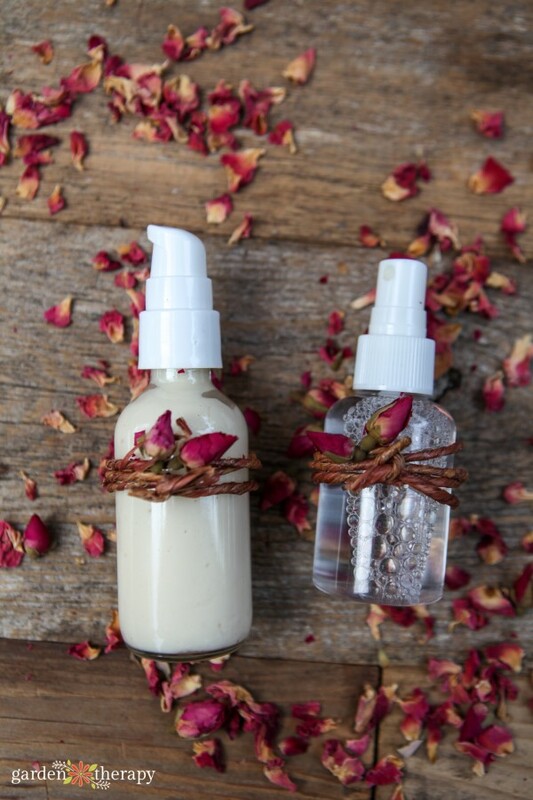 Here are my rose skincare recipes. Mix ingredients in a small atomizer and spray on clean skin after washing. Store the rose face toner in the refrigerator for up to one week. It doesn’t keep for long and it’s best used fresh, so make in small batches and discard any leftovers. This recipe is made specifically for the face. It’s based on my basic lotion recipe with rose elements added in. It’s a rich lotion that absorbs quickly and is non-greasy. It works beautifully for my dry, sensitive skin. Follow the lotion making instructions in this post. You can pick up all of the ingredients you need for these recipes from iHerb instead of driving all over town looking for them in a variety of shops. That alone is worth its weight in rose oil to me. While the special offer for this post has expired, all customers can get a discount off their iHerb order by clicking here.